I was exhausted from a couple of hours of drive on the Hyderabad roads. My most awaited Saturday was spoiled after I got into an argument in the evening with traffic cops when they misbehaved. I gave up knowing well it’s useless to argue further, quickly came out of the ego trip, and started my car cursing India and The world in general. I drove to Paradise restaurant for a Biryani take-away for dinner. On the way back I stopped my car near a traffic-signal. A boy came near me asking for money and started knocking on the car window. Most of us learned to ignore and look away. I confess I do ignore many times even though I feel bad. My food parcel was on the front passenger’s seat and that kid pointed his finger at it. I do not like giving money. But how could I possibly ignore when he is asking food that’s already a hand stretch away from me? I lowered my window and asked him to cross the road and wait near a Pizza shop. Realizing he might not know what a Pizza is, I told him to stop near a shop where people are eating and the shop’s board is in blue colour and there is a bus stop nearby. I was not willing to give my Biryani take-away as I was lazy to go back and get one more. I was in for a couple of surprises which I least expected. Without those surprises I wouldn’t have written about the incident here. I went near the pizza shop and waited for five minutes. And many thoughts crossed my mind. Why din’t I take him in my car? What if he comes after I leave? Why do I not do this every day but why today? Did he really believe me? What if I leave and he comes and thinks I cheated him? I forgot my obsessive thoughts about my fight with the traffic cops. I waited for five minutes and couldn’t find the boy anywhere near the shop. I thought he din’t trust me. But I started walking towards the signal hoping I would find him. I saw him with a girl and they were running towards me. But they ran past me as he din’t recognize. I called him and they stopped. All smiles on their faces. I was happy to see him. What surprised me was that he brought this girl, whom I assumed his friend. When I saw the girl with him, two words came to my mind: best friends. If he came alone, I probably wouldn’t have written about the incident here. A little while later he tells me that she is his younger sister. I ordered some pizza and pasta but the cashier made a mess out of my payment as he over-swiped my card by ten times and that delayed my order. The kids were all smiles and anxious – waiting to eat pizza for the first time. Finally the pizza came and I took it to their table with a coke and then the pasta came a little later. And then came another surprise that I least expected. I was thinking they would jump straight into the yummy pizza. The girl took the box and both stood up. They wanted to take it to their mother and eat with her. Knowing well this can be a wrong excuse, I told them if they don’t eat with me, I will take the food away. I convinced them for five minutes before they ate one slice each. Then few more minutes of convincing to eat half a slice each and kept one slice for their mother. And I told they can take Pasta box and eat at home – if they had one. 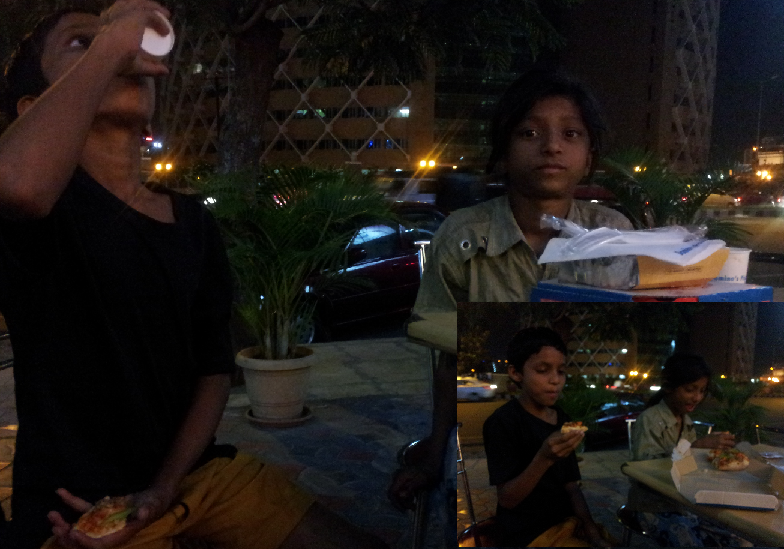 I spoke to them while they ate and they looked to be totally free from the worries of future. They got a pizza to eat tonight and they are happy till the next day morning before they go on finding food again. They told me that everyday they find food randomly. The boy said he is educated till fifth standard and can read numbers. I asked him to tell me when the waiting counter shows 330. He was repeating all the numbers as they changed. I was expecting to see him excited when he reads 330. But to my disappointment the waitress gave the box to me before the number was displayed. They said they liked the juice – I told it’s Coke – and obviously this must be the first time they drank Coke. The boy tells me about their parents and where they sleep everyday. And all the time he was smiling. I was wondering those innocent smiles are going to disappear from their faces soon. When they grow little older, they realize that they can’t smile any more. They know the world they live in is not a place that can make them smile forever like this. But then they were smiling like there is no tomorrow. And that left me to thinking how often do we smile like them? They took the remaining pizza slice and pasta box and ran and vanished into the buzz of the vehicles and the pedestrians. Here are the kids. Boy: Surya Prakash – means sunlight; Girl – Sri Lakshmi - Hindu goddess of wealth, prosperity (both material and spiritual), fortune, and the embodiment of beauty. I started my car with the same old thoughts. Why can’t we do something? But how can I? May be I need to earn enough money and leave my job and then start helping people. But how much enough is really enough? But more importantly, what happens when these kids grow-up like this? Their kids and their kids. Where’s the way out of this trap that you are born into? Am I just satisfying my ego here because I had a bad day? Are they happy or I am more happy? Why do we worry so much even though we have so much? I confess I do not do this everyday. Not even every month may be. Nor do I feel proud when I do it on those rare occassions. I was really moved when I saw the girl with him as I least expected it and the way they were running with a big smile and excitement on their faces. That made me write this post. A brother helping his sister. And the innocence on their faces and the happiness oblivious of the problems of the real world and their future. I am still wondering where is the way out of the trap they are so innocently born into? This entry was posted in: India, Life, Musings, PersonalBookmark the permalink. Post a comment or leave a trackback: Trackback URL. Just goes to show how pathetic we are when we cry/complain about our work and life. Whatever you did was noble for whatever (self or selfless) reason. There way out of this trap is rural rejuvenation which was our strength. well written and catchy title. Thank you Karteek! May be both self and selfless. I am glad you liked the writing. Feels good for that moment, doesn’t it? Its well worth the time and effort you put to do that. I agree that there is a larger issue underlying and we might not be able to do much, but at least you gave the kids those smiles, and their mother some heartwarming moments ( would like to think so!). Nice write up, one of the best I read from you in sometime. How was the Biryani btw? Thanks Bharath. Good to know this is one of the bests for you. May be because I din’t edit it for too many times and may be I just wrote whatever that came to my mind. Definitely feels good to do these things and at the same time we feel so helpless too. Thank you for reading. I am glad you liked. Seriously, you get addicted to smiling kids and cannot forget them and their smiles especially when its you who are the cause of it. Other thing is , they are all united, they share some bonding even though they are not related in any way. Finally, as you said, they live each day as if there is no tommorow. From a writing perspective, I particularly liked this line. “and eat at home – if they had one.” Makes the reader stop for a minute. Just wanted to share my thoughts…not really a “comment” as the label says. Thanks for reading and definitely any kids’ smiles are addictive because they are innocent. It was indeed a brave thing to do !!! To be frank, If I were you, I would not have done that. Not only me, Many of us would not thought about doing it. I must be honest to say that I haven’t done this many times either. This time I just did it without thinking what I was doing. May be because the way the boy asked for the food beside me moved me. Thanks Geeta. I am glad you were able to relate so well. That makes a writer’s day. I feel guilty every time I ignore someone on the road. To be honest, this boy had something special in the way he convinced me. He asked for the food without any hint of sadness, instead he was smiling even when he was asking me for food. Otherwise I would have done the usual thing of ignoring. Excellent write up Chandu, one of the best from you!! I could relate to your emotions and questions as I had a similar experience once. I was coming out from K&C at Himayatnagar and then a small kid ran into me and just stared the food but didn’t ask me for it. I called him and was about to give him 10 bucks but he was more interested in the burgers and other stuff I has in my hand. I realized it and don’t know what made me give away all that parcel. He coudn’t believe it first and then looked into my eyes and I just handed it away. He took it and that smile on his face was worth a million bucks. He immediately crossed the road and went to his father. I went inside the store and got another one for myself. When I was out, I didnt find him but when I started my bike suddenly the boy started shouting tata and waving his hand. All the communication happened just through eyes and that was the only word he uttered. Man, that was one great experience and tears rolled in my eyes. I was happy that I could help him with a meal. When I was back home, the same questions passed through my mind and I still wonder how and what we can do for many such wondeful kid’s future. Thanks Prasad. I seriously think you should blog too. You wrote this comment so well. Firstly good write up … I really felt “JOY OF GIVING ” and happiness in their faces – from your words. Just started my day at work with your blog. Great feel !! Thanks Phanendra. I am really happy to know that you started your day with my blog and you felt great. One of the best complements that I could ever get. You made my day. Chandra, very touching. Many of us feel the same when we see children around signals…everyone wants to help, but don’t know how to proceed. Thanks for feeding the children. Keep it up dude. It is very heart touching . feel good. how we complain for small things see this people are struggle for their basic needs. this article feel my eyes with emotions and realize what i have or not??? Ah now that was a nice read! but have you noticed, that random acts of kindness actually makes us more sad than not, thinking about how we don’t do it everyday and what the plight of the ones we helped would be after this day?